Intellectual property (IP) management is an area of corporate management that has often been neglected or overlooked by small and medium size businesses, and even more so by smaller third sector enterprises, despite the fact that effective IP management strategies can make the difference between the success and failure of an organization. 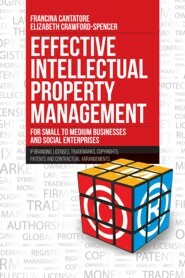 This book focuses on ways in which small and medium size enterprises - including social enterprises - can protect and manage their IP. "This book assists managers and boards to come to grips with their intellectual property, IP branding, copyright and patents." "As an IP practitioner, I found this book to be a very useful tool, particularly for SMEs who may not understand the importance of IP and how IP can be used commercially." "… written in an accessible easy-to-understand style which will appeal to a wide audience... a scholarly treatment of the subject, with the authors providing ample authorities and references as well as the results of qualitative research." Dr. Cantatore is an Associate Professor of Law at Bond University and teaches in the areas of Property Law and Media and Communications Law. She is a practising lawyer, and the Director of the Bond Law Clinic program, which consists of five pro bono law clinics. She researches in the areas of intellectual property, consumer law, media and communications law, third sector as well as legal education. Dr. Cantatore has received a Citation from the National Office of Learning and teaching for Outstanding Contribution to Student Learning, as well as a number of other teaching and research awards. She is Editor in Chief of the Australian Journal of Clinical Education, has presented at many international conferences, is the author of a book on copyright law and has published in numerous academic journals. Professor Spencer currently serves as Dean of the College of Business, Law and Governance at James Cook University. In addition to her work in intellectual property management, Professor Spencer's scholarship in franchising law and regulation has earned her recognition domestically and overseas. She is the author of books and articles on commercial law and regulation and consults with industry, the profession and governmental bodies. She also conducts research in the areas of non-profit governance and contracting relationships in development cooperation.